Scrivener is an invaluable piece of software for writing and organizing a book-length project—when you know how to use it. Developed by writers for writers, it does so much, but how do you know where to begin? How do you customize it for the way you work, and what can you leave aside? This course will enable you to unlock Scrivener’s most important features and leave ready to work. 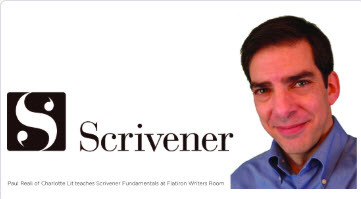 Students should download Scrivener in advance (30-day free trial available at www.literatureandlatte.com). If you bring your laptop with work in progress, you’ll get your book project set up before you leave. Register here now! This workshop meets from 10am-3pm on Saturday, February 23, 2019, with a one-hour lunch break between noon and 1pm. Register here now! This workshop is taught by Paul Reali, co-founder of Charlotte Lit. He is the co-author of Creativity Rising: Creative Thinking and Creative Problem Solving in the 21st Century. In addition, his work has been published in Winston-Salem Journal, InSpine, Office Solutions, Lawyers Weekly, and others. His fiction has been awarded first place in the Elizabeth Simpson Smith and Ruth Moose Flash Fiction competitions, and he received a Regional Artist Project Grant from Charlotte’s Arts & Science Council in 2018. Paul has an M.S. in Creativity from the International Center for Studies in Creativity at SUNY Buffalo State, where he also is an adjunct instructor and the managing editor of ICSC Press. Paul has been a trainer and facilitator for more than 25 years, in the areas of creativity, innovation, and business and writing skills. Register here now! To pay by check instead of via Eventbrite, mail your check to the Flatiron Writers Room, 5 Covington Street, Asheville, NC 28806. You will be registered when we receive your check, space permitting. If the instructor has to cancel the workshop due to weather, the Flatiron Writers Room will email you by 9 am. the day of the workshop. If you cannot attend the make-up date, you will receive a refund. The Flatiron Writers Room reserves the right to cancel this workshop if not enough people sign up, in which case you will receive a full refund. You may cancel your registration up until seven days before the first class session, via Eventbrite for a full refund. After that date, no refunds will be made.